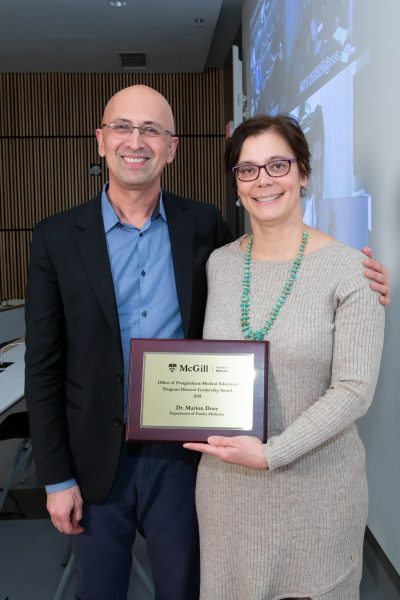 Dr. Marion Dove, a Family Physician, Associate Professor, Associate Chair (Education) and Director of Postgraduate Medical Education (PGME) for the Department of Family Medicine at McGill University is the recipient of the 2018 McGill PGME Program Director Leadership Award. The award recognizes her outstanding commitment to enhancing residency education and her dedication to driving ongoing innovation to improve the program and the University. Dr. Dove runs the Faculty of Medicine’s largest residency program, a bilingual program with over 250 trainees working at nine sites – six in Montreal and the others in Châteauguay, Val D’Or and at the Campus Outaouais in Gatineau. To read more, click here. This article was initially published in Med e-News and written by Lisa Dutton.